USA – Yellowstone Lake - Proteins found on ancient stone tools recovered from the shores of Yellowstone Lake tell of great bear, deer and rabbit hunts. But researchers have found no signs of boat making – no bone hooks to indicate that paleo-Indians came to the water to fish. An archaeology team from the University of Montana will return to the shores of Yellowstone Lake again this summer to wrap up a five-year survey on the lake’s prehistoric shoreline campsites. Native Americans have traveled to the site for thousands of years and researchers want to know what attracted them to Yellowstone Lake. Did fishing play a part in their summer visits? Or were they only passing through to collect obsidian from the park’s rich volcanic cliffs? MacDonald, an associate professor in the Department of Anthropology, has identified 285 prehistoric campsites around Yellowstone Lake. But what brought paleo-Indians to the shores of Yellowstone Lake remains a mystery to researchers. The team has documented lakeshore campsites dating back 9,400 years, and while early speculation suggested they may have come to fish, evidence shows no signs of boat making or fishing. Camp sites surrounding the lake date back 9,400 years. 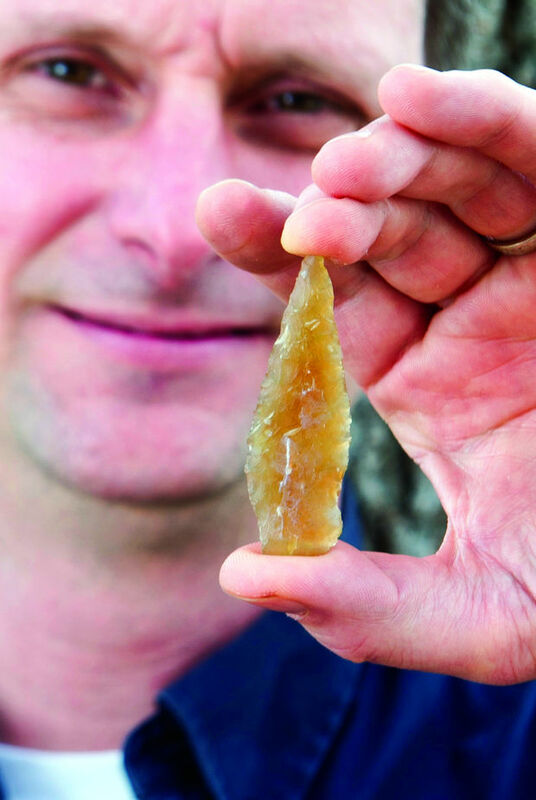 Speer points chiseled from obsidian have been recovered during shoreline digs, along with arrowheads dating back 1,500 years — a tool MacDonald described as a strong chronological marker. While campsites surround the lake, most of the artifacts recovered by the team thus far have turned up on the lake’s northern shore; areas near the mouth of the Yellowstone River and in the area of the Fishing Bridge. The campsites around the shoreline are scattered and considered low density, MacDonald said. It fits the pattern expected of campsites used by hunter-gatherers en route to another location. “They were pretty much moving through the area and not establishing villages,” he said. “It’s short term camps — going to the lake and getting resources. We’re finding fire features where they’d hang out for a night or two before moving on.” Speer points also have been recovered from the lake’s islands. But the water is too cold and the islands too far from shore to reach by swimming. Many speculated that paleo-Indians used boats to reach the islands, but McDougal believes early people may have arrived in the spring before the ice retreated and walked to the islands. GRECE – The pillaging of Greek antiquities during the German Occupation of WWII could surpass more than 8,500, according to the journalist Giorgos Lekakis. If those items were sold today in auction houses, their value would reach €1 trillion, or about $1.3 trillion, he said. The German occupiers were disrespectful even towards the Acropolis. In 1941, they installed anti-aircraft batteries inside the Parthenon. They installed platoons of soldiers that engaged themselves in indescribable crimes. They shot the sculptures and used the monumental gateway to the Acropolis (Propylaea) as a latrine. They turned the Museum of Livadia into a garage for repairing bicycles. German archaeologists robbed museums and carried out illegal excavations in 17 areas of Greece, the various finds of which were sent to Germany. In 1944, during their departure from Athens, Germans shot and used their bayonets to destroy statues and vases on the Acropolis and in the Kerameikos (Ancient Cemetery), as described in a 1946 report by the then Greek Ministry of Education. In various regions as Thiva, Heronia and Tanagra the occupiers stole treasures, chased Greeks out of the museum and installed themselves in it. In Mycenae they shot the Lion Gate and caused extensive damage to the Treasury of Atreus. In Knossos, a German general ripped off the museum; soldiers carried out boxes of Minoan, bronze and stone statues from the museum to his mansion. Archeologists from the Archeological Service in Greece had the foresight to hide many of the antiquities before the German invasion and also had the courage to protect them. The German Conquerors tried hard to discover the hidden antiquities by exerting pressure, but they met with the stubborn resistance of Greek archaeologists. INDE – Hyderabad - The illegal sale of a large 300 year old antique, stone-studded silver conch was foiled by the city police on Saturday. Tests by the archaeology department dated the Dakshinamurthy conch back to the 1700s. The metre-long silver conch weighing about 8.1 kilograms is studded with precious stones. The conch was sent to the department of archaeology to trace its origins. “Preliminary reports revealed it could be about 300 years old. ROYAUME UNI – Lair - The excavation of an ancient Pictish long house in Highland Perthshire will continue next month. The continued community excavation of the long house at Lair, Glenshee, is a key part of the programme. Such medieval rural structures are rare in Scotland and the examination will offer an exceptional window into the past for the experts involved. TURQUIE – Aizanoi - The proud bearer of the title of the world’s first stock exchange, the ancient city of Aizanoi in Kütahya has become a source of inspiration in the promotions for the Istanbul Stock Exchange, which recently became Borsa Istanbul. Aizanoi, which is located in the inner Aegean province’s Çavdarhisar district, is now being used in the promotions for BIST, a recent amalgamation of the İMKB and the Istanbul Gold Exchange. Archaeologists working at the site in 1971 discovered inscriptions indicating the existence of a stock exchange during the Roman era. According to the inscriptions, a slave’s price was equal to a donkey, while a horse was worth three slaves. Notably, a round-shaped structure dating back to the second century A.D. contains a copy of a paper from Emperor Diocletian that was written in 301 A.D. that outlined regulations on sales prices for goods in the market. Because of the document, many have claimed that Aizanoi possessed the world’s first stock market in its Macellum building. 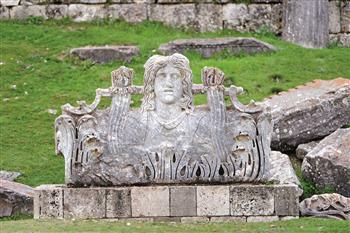 The head of the Aizanoi excavations, Pamukkale University Assistant Professor Elif Özer, said the world’s first stock exchange was one of the most important structures in the ancient city. She said the round structures and inscriptions in the Macellum area, known as the stock exchange building, had become a current issue during works for BIST and had drawn the attention of brokers, bankers and investors. “In the round building, which was unearthed in the ancient city after the Gediz earthquake in 1970, there is the Narh legal decision that the Emperor Diocletian issued in order to prevent an abnormal increase of prices and take inflation under control. The legal decision was the equivalent of economic recovery programs that are taken after each economic problem today,” she said. She said some prices in the legal decision had drawn attention. “For example, the daily wage of a painter was 150 dinars, while the daily wage of a jurist or lawyer was 250 dinars. The wage of educators is one of the lowest. The ceiling price in ancient times continues to be an inspiration today. This is why Aizanoi is used in promotions for the Istanbul Stock Exchange (İMKB), which recently became BIST.” Aizanoi is 57 kilometers away from the provincial center of Kütahya and is known as the second Ephesus thanks to its 20,000-person-capacity amphitheater, 13,500-person-capacity stadium, a bath, a street with pillars, a necropolis and the world’s first stock exchange. The name “Aizanoi” comes from the mythological hero “Azan,” while the city is believed to date back to 3000 B.C. During the Hellenistic era, Aizanoi was seized by the Pergamon Kingdom and Bithynia from time to time. The city later fell under Roman rule but gradually declined in importance in the early Byzantine era. German archaeologists had been conducting excavations in the ancient city since 1970, but the dig was transferred to the control of Denizli’s Pamukkale University in 2011.